The Russian ruble has declined by roughly 9% versus the U.S. dollar since the start of 2014.
International markets were roiled Monday and the Russian currency hit a three-week low as traders and investors worry about renewed tensions between Russia and Ukraine. 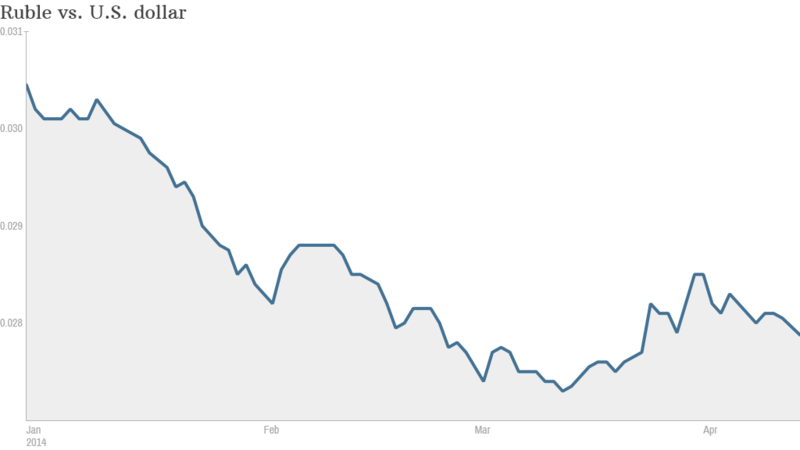 The ruble declined by roughly 0.7% Monday versus the U.S. dollar -- not far from the lows seen in mid-March. Russia's main stock market index also dipped by nearly 2% before recovering slightly. The Russian Micex index has declined by more than 10% since the start of the year. Investors are growing concerned again about increasingly tense relations between Ukraine and Russia over turmoil in Ukraine's eastern region. European and emerging markets were declining and crude oil prices on the NYMEX hit a six-week high before edging back down. Ukraine and western nations are accusing Russia of deliberately trying to destabilize parts of eastern Ukraine ahead of national elections in late May. Russia's foreign minister Sergey Lavrov denied that Russian forces were active in the east. British foreign secretary William Hague said more sanctions may be needed. "Further sanctions have to be the response to Russia's behavior," Hague said Monday at a meeting of European Union foreign ministers in Luxembourg. Hague said the ministers would need to negotiate "much more far-reaching" punishments against Moscow. Earlier this month, the International Monetary Fund slashed its economic growth forecast for Russia and warned of a wider economic fallout if the Ukraine crisis escalates. The IMF expects Russia's oil-rich economy will grow by 1.3% in 2014. That compares with its January forecast of 1.9%. Other forecasters, including the World Bank and some in the Russian government, expect a much weaker outcome due to a flight of capital and an emergency interest rate hike.